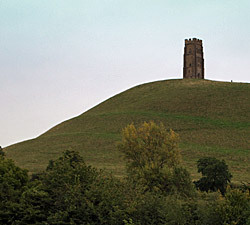 Glastonbury is situated on the low-lying Somerset Levels, some 30 miles (48 km) south of the city of Bristol. In times gone by, this area of Somerset was flooded in winter by a marshy sea. In summer the water levels would fall allowing settlers to move about more freely and graze their animals. 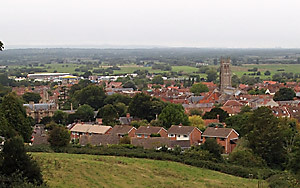 The inhabitants of this region became known as "the summer people", hence the county name "Somerset". It was in this marshland on a sector of higher, drier ground that Glastonbury sprang up. The town appears to have been inhabited since the Neolithic age and a Christian community is thought to have existed from the earliest days of the Church in this country. The Saxons built the first stone church around 712 AD, the Saxon king Centwine being the first supporters of Glastonbury Abbey. It became one of the most important abbeys in Britain and in 1016 was chosen for the coronation of Edmund Ironside. The success of the town continued to be linked with the unbroken importance of the abbey until the Dissolution of the Monasteries by Henry VIII. After this, the abbey fell into ruins but the town itself continued to thrive as a commercial centre. Today, Glastonbury lives on as a tourist attraction, the ancient buildings and unique atmosphere continuing to draw visitors from all over the world. The legendry visit of Joseph of Arimathea, who is supposed to have planted his staff in the ground, which then miraculously flowered into the Glastonbury Holy Thorn, continues to draw pilgrims and curiosity seekers. The town has also been identified with the legendary Isle of Avalon where King Arthur is said to be buried. These stories and the region's spiritual ambiance have led to the town becoming something of a centre for the New Age religion. The town contains many interesting old buildings associated with the abbey such as the Tribunal, the George Hotel and the Pilgrims' Inn. The Somerset Rural Life Museum is housed in the old tithe barn. The Church of St John the Baptist dates from the 15th century. The world's largest music event The Glastonbury Festival is held each year at Worthy Farm, Pilton, just east of Glastonbury. The Romantic ruins of the ancient Abbey are set in 36 acres of delightful parkland right in the centre of town. The ruins of the great church, along with the Lady Chapel, form a grade I listed building and is open to the public. It is approached by the Abbey Gatehouse which was built in the mid 14th century and completely restored in 1810. The 14th century Abbey Barn is also open to the public. Glastonbury Abbey has been a place of pilgrimage since the Middle ages. Resting place of Saxon kings and of the legendary King Arthur. The Visitor's Centre contains a model of the Abbey as it would have looked in 14th century and also displays the splendid 16th century Othery Cope. This is a prominent hill some 525 ft high just outside of town. It was a sacred site from the earliest times and a centre of pilgrimage from the Middle Ages on. St Michael's Tower which crowns the summit is all that remains of a 14th Century church. As you would expect from this area, the hill has many associated myths and legends and is said to be the home of Gwyn ap Nudd, the Celtic Lord of the Underworld and a place where the fairy folk frolic. The Tor is owned by the National Trust and there is free access to the public at all times. It can only be reached on foot from a car park on the edge of town. Located on the first floor of the Tribunal, the Lake Village Museum depicts life in an Iron-Age settlement some 2000 years ago, when large areas of Somerset were covered by marshes. The actual site of Glastonbury Lake Village is 3 miles (5 km) North West of Glastonbury but there is nothing to be seen there today. The village is thought to have been built around 300 BC and occupied until around 100 AD. It was then abandoned, possibly due to a rise in the water level. It was built on an artificial foundation of timber filled in with brush wood, bracken, rubble and clay.